Congressman Bobby Rush convened a roomful of heavy hitters who promised to bring "hope and healing" to scarred neighborhoods. The reporters were told to wait outside the meeting room. The suggestion was that something big was happening in there. We were in the south-side office of Congressman Bobby Rush. He'd sent out word that he was convening a large group of elected officials, business leaders, and clergy to discuss what can be done about the daily casualty counts in Chicago. Rush's office is on a busy stretch of 79th Street in Chatham, just a couple doors down from where special-education teacher Betty Howard was slain by a stray bullet last week. Her killing was one of at least 137 since the start of 2014, a rate of nearly one a day that's climbing higher as the weather warms. The city has also averaged almost six shootings every day. Most area elected officials are frustrated and unsure of what to do about the violence, so they just don't discuss it. But others—including Mayor Rahm Emanuel—regularly respond by holding press conferences, often to blame political opponents and propose tougher laws. As a veteran TV reporter joked as we waited Wednesday: "They solve this problem ten times a year." Finally, about a half hour after the scheduled press time, reporters and camera crews were invited into the meeting—just as it was breaking up. There was no way for us to know what had actually transpired—who'd proposed ideas or who'd tried to cover their asses—but we were allowed to catch glimpses of Governor Pat Quinn, schools chief Barbara Byrd-Bennett, and state's attorney Anita Alvarez as they walked out the door. Other heavy hitters—including Mayor Emanuel, Cook County Board president Toni Preckwinkle, and police superintendent Garry McCarthy—stuck around for the cameras, lining up alongside Congressman Rush as he announced the formation of the "Working Group on Hope and Healing." Less clear is what the group is actually going to do. Rush said goals include creating jobs, rehabbing a vacant building down the street to use as a training center, and bringing a neighborhood festival to East 79th Street. But he said that will be worked out in the coming weeks and months. The other officials expressed similar ambitions. The mayor promised that the group would work on revitalizing the surrounding neighborhood and "bringing back what has slipped away." He then left for another event. McCarthy noted that he had first deployed extra police in the area two years ago, but that law enforcement alone wouldn't change anything. 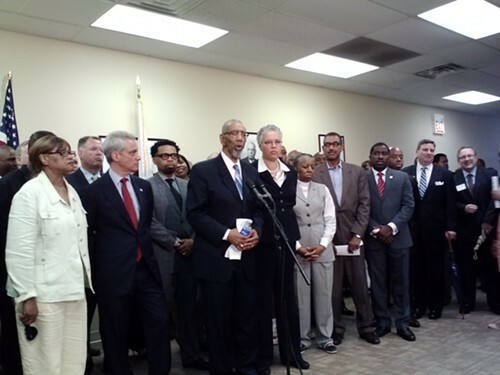 Preckwinkle stressed the importance of jobs in keeping young men out of gangs. Michael Sacks, a hedge-fund manager who's one of Emanuel's biggest donors and closest advisers, promised the support of the business community. None of the proposals were specific, no dollar amounts were committed, and no timetable was established. Rush conceded that he and others had tried this before. "We had a similar meeting in 2006 at my church in Englewood," he said. But this group is more committed, Rush said, and would meet again as soon as next week. He insisted that the spirit of the gathering was itself a sign of progress. "We were not in here pointing fingers," he said. "We were holding hands."